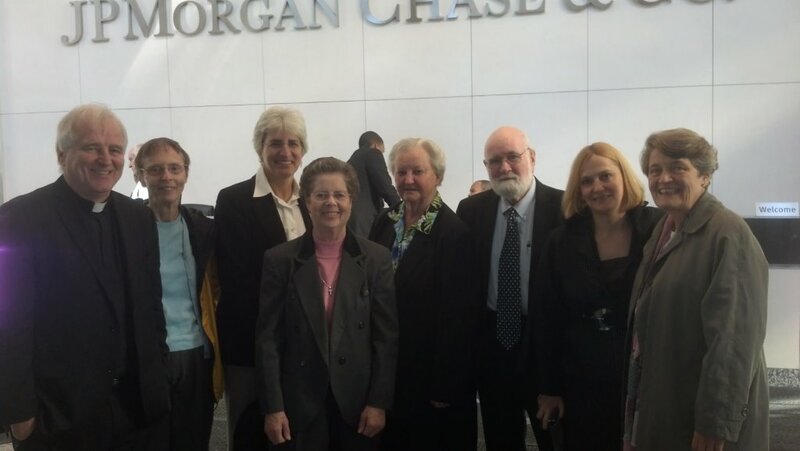 Shareholders from the Interfaith Center on Corporate Responsibility engaged JP Morgan Chase at a meeting last Monday in New York on a broad range of issues from risk management to foreclosures and other business practices. On November 19, the bank finalized a $13 billion settlement agreement with the US Justice Department over “alleged bad behavior relating to mortgages and mortgage-backed bonds,” as Marketplace reports. JP Morgan Chase bought up Washington Mutual and Bear Stearns after they went under in the financial crisis of 2007-08. All three institutions, along with other banks, had bundled hundreds of home loans into securities and marketed them as investments that could be traded like stocks. When millions of homeowners defaulted on their mortgages and the housing market collapsed, the value of the securities took a nose dive and the economy went into a tailspin. Responsibility for the meltdown is still being apportioned, while hundreds of thousands of families lost their homes. ICCR investors hope that some of those who suffered in the financial crisis will benefit from the settlement. Part of the $4 billion for consumers would go toward helping some homeowners whose mortgages are handled by JPMorgan. Unusually for such settlements, another share would be used to reduce blight in neighborhoods peppered by rundown and abandoned homes.